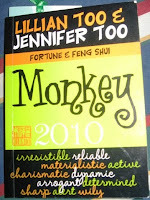 I have been trying to finish reading a book that Clet bought for me a month ago, the "Monkey 2010 Fortune & Feng Shui" by Lilian & Jennifer Too. Clet bought one on his animal sign earlier and I requested him to bought one for me too. We have been buying these books for our reading pleasure and references for the last 2 years. Interestingly it tells the recommended feng shui cures, remedies & enhancer for the year in general as well as on each individual animal sign, depending on which book you buy. The book tells that it is not going to be an easy year for everyone and for Monkey, it is in direct conflict with the Tai Sui and the affliction of the wu wang causes some obstacles to manifest! Oppss.. There are some recommended remedies in this book..but it is quite hard to follow exactly what the book says but it is good to know what is going on "around" us, to me feng shui is about the environment and surrounding at where we are, both our home and our work place. Feng shui is a very interesting living science, there are so much to learn about.